Concern turned to confusion as Boykins expected to be at risk for vWDII (based upon their genetic testing results) failed to show any signs of a clinical clotting disorder. In addition, results of additional blood tests looking at the product produced by the gene on several “at-risk” dogs showed no deficiency in vWF protein and no increase in blood clotting times. 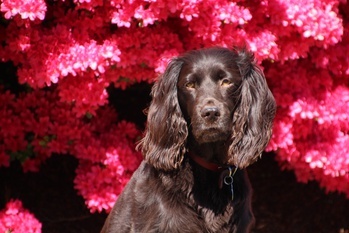 At that time, PPG made the decision to remove the test from the Boykin spaniel testing panel for routine genetic testing and place it in an “additional diseases” section for potential use to rule out this mutation as a cause of disease in Boykin spaniels with observed clotting problems. The scientific team at PPG actively monitored the situation and contemplated several possible explanations for the discrepancy including genetic differences between breeds, variable disease presentation, and the possibility that the originally described genetic mutation was not the actual cause of vWDII. Indeed, results of a new study published in the February 2017 issue of Animal Genetics (Vos-Loohis and colleagues) show that the original VWF gene mutation described in 2004 is likely to not be the cause vWDII on its own and may not contribute to the manifestation of the disease at all. In addition, a newly described mutation in the same gene appears to correlate with vWDII in the German pointers. This newly identified mutation that appears to be the cause of disease is located very near to the DNA change (referred to as ‘linked’) that laboratories have been using for years to diagnose vWDII. The fact that these two DNA changes lie very close to each other in the genome, is responsible for the finding that German shorthaired pointers inherited both mutations in dogs with disease and did not inherit either mutation in clear dogs. However, the DNA change that has been used as the diagnostic tool, does not appear to be linked to any disease-associated mutation in other breeds. Therefore, if a German shorthaired pointer had inherited the original DNA change, it also inherited the newly described disease associated mutation, making it appear that the original DNA change was the cause of abnormal clotting when tested. However, the investigators in the new study showed that the original DNA change probably arose first in the genome of an ancestor dog to many different breeds, but that the causative mutation likely arose near to this benign DNA change in the shorthaired pointer (or it’s closely related ancestor). Along with the Boykin spaniel, the PPG laboratory had also identified the Chinese crested as a breed that inherited the original DNA change in relatively high frequency, but failed to show signs of disease. Given the identified correlation between the new mutation and vWDII and the apparent lack of disease correlation with the original DNA change, testing for the newly described vWDII mutation would be most appropriate to diagnose vWDII in the German Shorthaired Pointer. At this time, it is unknown if any breed outside of the German pointer breeds may carry the newly identified, disease-causing mutation. If you have questions about vWDII or previous vWDII test results from your breeding program or if you have general canine genetics questions, please feel free to contact the Paw Print Genetics Laboratory (509-483-5950 or AskUs@pawprintgenetics.com) to speak to one of our veterinarians or geneticists. Vos-Loohis M, van Oost BA, Dangel C, Langbein-Detsch I, and Leegwater PA. A novel vWF variant associated with type 2 von Willebrand disease in German Wirehaired Pointers and German Shorthaired Pointers. Anim Genet. doi:10.1111/age.12544.